If ever there was a sign that VPNs are going mainstream, it is when they start signing commercial deals with high-profile sports teams. 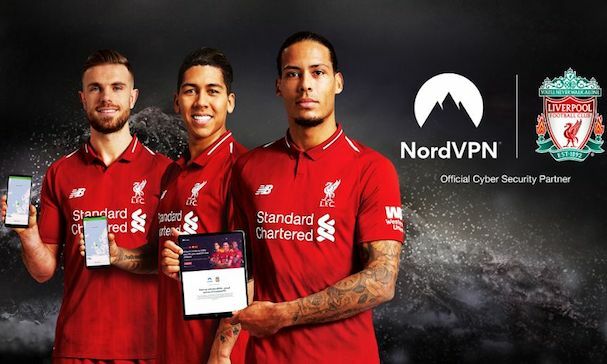 So, yesterday’s announcement that NordVPN is now the official cyber security partner of English Premier League side Liverpool FC could be viewed as a landmark moment in the development of the whole VPN industry. Liverpool is one of the most successful football teams in England. It has won 18 English league titles and 5 European Cups during an illustrious history. Last season, the team went all the way to the Champions League final and under manager Jürgen Klopp plays one of the most exciting brands of attacking football in the league. They are also a huge global brand with fans all over the world, players from places as diverse as Egypt, Brazil, the Netherlands, Senegal, and Serbia. They also have commercial deals with brands from all corners of the globe. But this is the first time that Liverpool, or indeed any Premier League side, has teamed up with a VPN to promote cyber-security and online security. As Liverpool FC’s Managing Director and Chief Commercial Officer, Billy Hogan, explained online security tools such as VPNs are essential in a modern society. “While individuals are ultimately responsible for the information they share, having an extra layer of protection is highly recommended,” he enthused. In many ways, NordVPN and Liverpool are the perfect match. Like Liverpool, NordVPN is one of the biggest names and best-performing providers in the VPN market. As our recent review has shown they offer users super-strong encryption, a huge server network, and thanks to recent infrastructure investment, some of the fastest connection speeds around. Being based offshore in Panama means that NordVPN is not subject to the intrusive surveillance and data retention laws of many western and authoritarian regimes and can, therefore, offer a no user logs policy that their customers can depend on. But while the deal is great news for NordVPN and Liverpool fans, it could also be a big boon for the VPN industry as a whole. Up until this point, VPN providers like NordVPN have tended to focus their marketing on related cyber-security publications and events. This approach has certainly proved effective, but there are many regular internet users who don’t engage with such content and often they are unaware of VPNs or unclear of the myriad of benefits they provide. By signing a deal with a high-profile sports brand like Liverpool FC, NordVPN is going mainstream and hoping to take their brand to a much wider audience. But they are also going to promote VPN technology more generally. It is notable that, in welcoming the deal, NordVPN CEO Marty Kamden focused on the technology rather than his own company’s’ brand. The deal should achieve exactly that and it is likely that other high-profile providers like ExpressVPN and IPVanish may follow their lead. The details of the Liverpool-NordVPN deal have not yet been revealed. But it has been confirmed that part of the arrangement will see NordVPN offering fans of Liverpool FC information about online security and the benefits of using a VPN. It seems likely that the NordVPN logo may crop up around Liverpool’s Anfield ground on matchdays too, while the Liverpool logo and player images may well start to appear on NordVPN marketing materials. One offer that is already available to Liverpool fans is the chance to sign up to NordVPN with a great deal. Fans who sign up for the three-year NordVPN deal will be eligible for a discount which takes the fee down to just US$2.99 a month. They will also be entitled to a 30-day money-back guarantee. Don’t worry if you are not a fan of Liverpool. Here at VPNCompare.co.uk, we can also offer you the same hugely discounted rates. Just click on this link to sign up now. One advantage of using a VPN that we assume Liverpool FC won’t be promoting too hard is the ability to use a VPN to watch Premier League football outside the UK. By connecting a VPN to a UK-based server, you can access the online streaming services of both Sky Sports and BT Sport from anywhere in the world. This means you won’t have to miss a minute of the action from any Liverpool FC game, or any other team either.